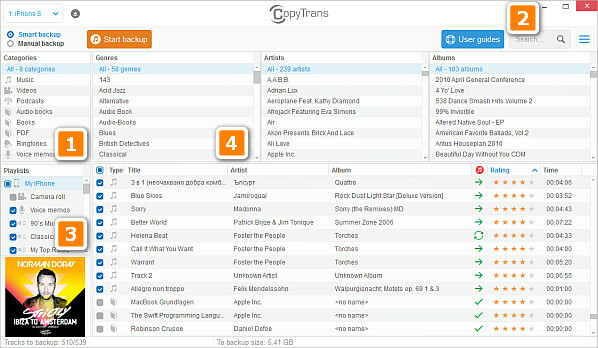 CopyTrans “Smart Backup” automatically transfers all tracks, track information, artworks and playlists from your Apple device to iTunes. CopyTrans knows and decides what needs to be transferred and never creates duplicates. This article explains what exactly Smart Backup does and what is included in the transfer. If you want to use it right away, follow Transfer music from iPhone to iTunes guide. If more than one device is connected, please select the correct iPhone from the drop down menu. All tracks that need to be transferred or updated in iTunes are automatically selected. If you want to take full control and customize every step of the backup process, choose the “Manual Backup” mode. If “Smart Backup” is not possible, please follow these troubleshooting tips. To show the detailed status of a track, simply hover your mouse over it. This track is in iTunes but not up-to-date. Track should be updated. This track is in iTunes and up-to-date. Track should be skipped. Use the Categories, Genres, Artists and Albums menus to easily browse your iPhone. You can search for specific tracks by using the search box. Click on an iPhone playlist to display its tracks. Sort tracks in the main list view by clicking on any column name. Note: Right click a column name to hide or show additional track details. You now know all about the “Smart Backup” feature.